I am also blogger A, I am also blogger A…wait let me go back and click on the vote button! Hilarious! it’s a fact of life and not only limited to indibloggers. The bonding of any relationship depends on “give-and-take” There should be a proper balance between give and take. The relationship would go for a toss if “give-and-take” goes out of proportion. Idea sparking now and then – huh! where do i fall though ? Haha…nice concept. I don’t know in which category I fall, but I like to reciprocate things. Most of the bloggers whose blogs I visit on Indiblogger fall under category A. And I guess I have seen your comment on every blog. hehehehe .. I prefered being on the safer side before categorizing !! I am prone to letting fellow bloggers know I visited their blog and that if i liked or had something else to say … and indeed it makes sense . everyone’s time is precious so if you give your time to a post .. he/she should know it . Not many bloggers respect their co bloggers efforts !! But thats part and parcel .. competing would have been lot more difficult .. had everyone been ethically correct 😉 thanks for sharing your view Sourav! appreciate your time! your works are amazing, and so is your wit! thank u Sharmistha for informing me that your comments were not reaching me and the spam !! thanks again i could fetch out comments of many bloggers whom i thought belonged to the E Type 😀 thanks again !! your works are amazing, so is your wit! I do think I fell off my chair in here… this is bloody hilarious and as much as we want to run away damn true!!! great work Jack this time awesome!! It is good to be able to laugh on self! yes it needs practice and allows us room for improvements !! Aint it ? and that is a fact !! sirf ladkiyon waali post chor kar.. ab lipstick waale post pe .. if i write .. wow thats a great post .. i will be doubted with my preferences 🙂 hai ki nahi ? Seems you are coming out of new ways to compel your blog visitors to either like or comment on your post. And just to add, you succeed in that every time. thanks AJ 🙂 Appreciate your view ! I think its the content which matters a lot .. and when its an informative post there is no debate .. or if its a photo blog or poem ..
but a blog on political or social matters can never have cent percent agreeing and happy readers ! hahahaha…your cartoons are amazing and this one really says many words in few figures. Love your blog. Passing on a Liebster Award to you. Please collect it here http://sakshinanda.blogspot.in/p/awards.html Happy blogging! Ha ha ha. ‘E’s are incorrigible. Am still trying to figure out which one I am…. I am new but I think I am Type A. Sochne mein kya jaata hai na? Loved it. Simple and effective. Samajhne wale samajh gaye jo na samajhe woh anarhi hai. Nice, and so true! I’ve been blogger A sometimes and Blogger D sometimes. But as a person who considers every blogpost as a creation, I’d like to see real like on it, even if it’s far less than ‘etiquette’ likes. I try to do the same for other blogs, even if the other person thinks I’m blogger D.
Its perfectly Ok that way ! One may not like a post which is liked by 9 out of 10 bloggers.Thats a personal liking and one need not be following the other 9 . One needs to be in between being too generous for all bloggers and looking to snobbish to all .. thats what I feel personally !! Likes and comments should not be spent too miserly also because after all people blog to be heard . Had it been for self satisfaction .. there are online and offline diaries to meet the needs . Aint it ?? Thanks for dropping by Chaitanya and expressing your views on the issue ! 😀 you should have asked for his address and then both of us would have done the awesome job ! 🙂 Unethical practices inspire easily. Its good if you do not like someone’s work you need not be promoting it at all Pankti ! Thanks for sharing your views on this. Nice depiction of the types. I think there is also a type that just votes but doesn’t care to read what’s written. Nice post & nice snare!! You have us all thinking where we fall—or fail. hehehe thank you for dropping by dear Kriti.. you are a hard nut to crack .. I confess..
thanks a ton friend for dropping by and liking my work and most importantly expressing your views !! Appreciate it 🙂 !! Depends from people to people … so well described and thought of doodle ! loved it Mysay …. I would rate it 5 out 5 for this one ! This post connected every indiblogger in someway or the other ! Just few lines of appreciation ! You have it all covered in your mind..
there is nothing hiding from your radar eyes ..
May it be politics or current affair..
you cant get away from his doodle of surprise ! wow thank u thank u thank u so very much my brother .. I should make a header out of it !! 🙂 thank you again my brother . these lines are by far amazing !! I think with different people, we fall into different categories :). Nicely presented! 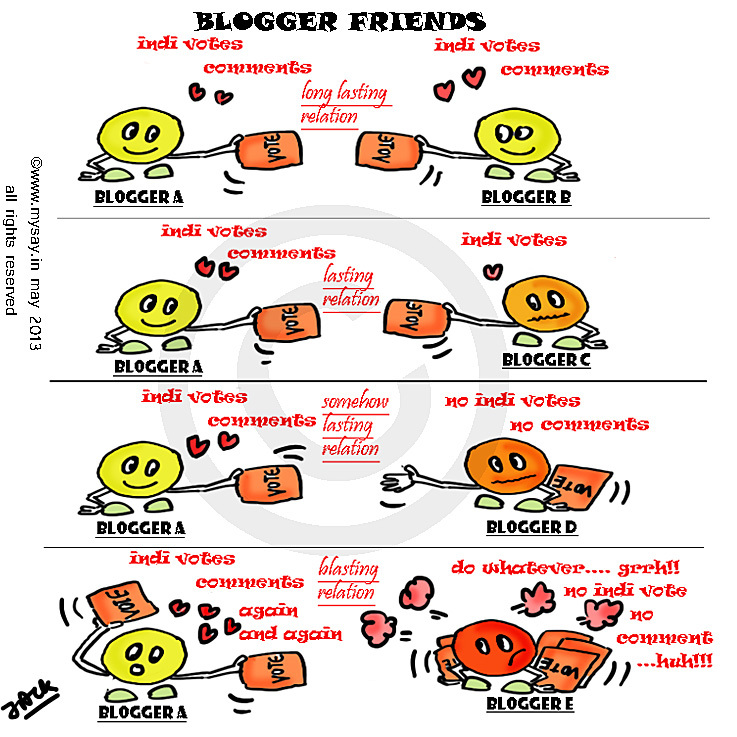 Thanks Richa for sharing the most matching view I have towards the blogging and Indiblogging community !! Ha..ha.., that was an interesting revelation! thank you Aashish for that extraordinary compliment .. means a lot for a small time doodler !! Hope to see you often on this space .. thanks a again my dear friend .Appreciate it ! Thank You Bushra for that wonderful compliment . I would love to see you more often and work harder to see you do so dear friend. Awesome, factual, and funny……ur best….u keep bettering urself…..and u dnt hav to switch places wd me……u r a master of doodle……cartoon is ur baby……. thank you for the shower of those golden words .. my brother Ritesh .. But i m not a good poet……i hvnt written many poems….and most of them are pretty mediocre as compared to wat othrs write…..i m still trying to get better in it……i wud write one for u definitely…..but i wil hv to really polish my skills. Impressive…then there are few others also…who doesn’t wait for you vote or comment…but they comment on all your latest post religiously…!!! Hah ha Nice idea to grab user feedback. Enjoyed your cartoons. By the way i am blogger A category. Though at times work schedules prevent me checking up my networks posts at times.Whenever i find some free time i check my network post and vote/comment/like them. Ha thats Funny. and creative I must say. Just found out your blog and glad I visited it. Hope to be a blogger A. You definitely are. I can see that! Thanks for liking the post!! Thanks for dropping by and sharing thoughts … Blogging is all about a good post and a great PR 😉 as many blogging pals .. that much better 😀 Happy Blogging!! This post is just perfect <3 Great Job! The contrast between the different kind of bloggers cannot be put forth in any better way 🙂 Fun yet factual! true that !! 🙂 i always leave a comment after reading 🙂 any blog !! so whenever I feel free. I do votes and comments as well. My first visit . Loved reading this piece. short and sweet! lovely comic description…i too am trying and adding comics on my post makes it interactive! well, do read my blog and give a feedback!!! 🙂 better we be a COMMENTS AS WELL AS VOTES KINDA INDIBLOGGERS!!! Hahahaha!! truly!! damn cute! and damn correct!